For someone who suffers from acne, chemical exfoliation should be an important part of skincare. But if you are like me, have both acne prone, dehydrated and sensitive skin then using chemical exfoliation products can be problematic. I tried some regular exfoliating toners before (from Murad not Paulsa choice), every time my skin got irritated, itchy and broke out, it was just crazy as hell. 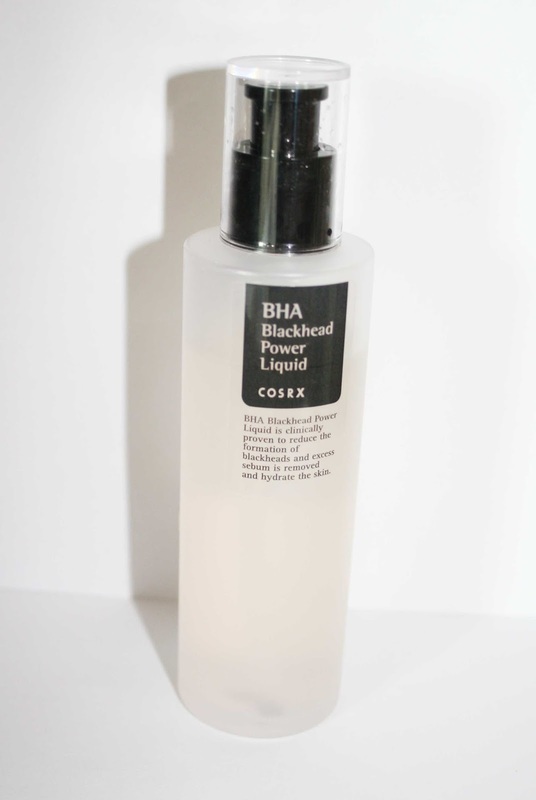 I started looking for an alternative, something milder and with my love for koreanbeauty found the Cosrx BHA Blackhead Power Liquid. Cosrx is a Korean brand that gets a lot of attention lately, mainly for its well formulated chemical exfoliation products. In general, Korean brands are not known for exfoliating products and this step is often absent in the skincare routine of Korean women. Maybe its because Koreans tend to have sensitive skin and exfoliating is a pain for them. Its also true that Korean women find product layering to moisturize the skin very important, while chemical exfoliation tends to strip the skin of moisture. My skin type is combination dehydrated sensitive acne prone ( cheeks only), yep basically everything at once. I do get acne occasionally (limited to a few pimples) but clogged pores are an everyday problem, tend to stay there forever. Also chemical exfoliation helps fade acne marks and hyperpigmentation, which is one of my main skin concern. So despite my previous skin reaction to chemical exfoliation I bought into the 'Cosrx hype' and hoped for the best. 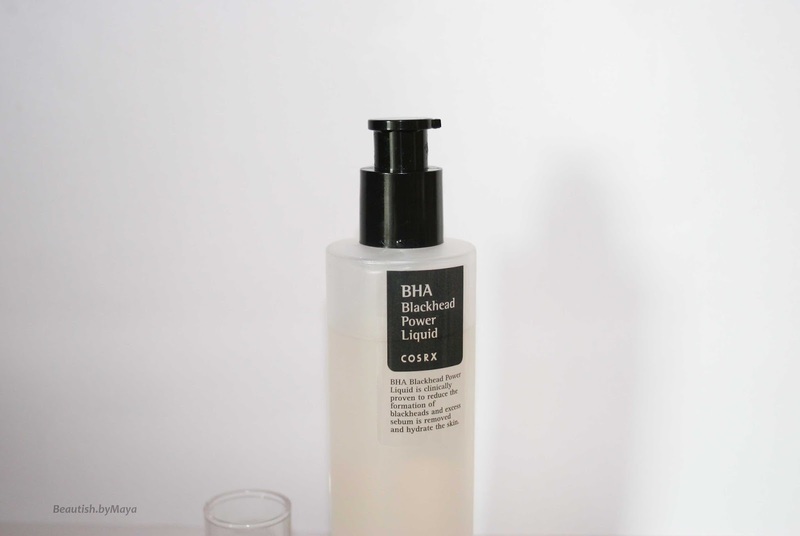 I love Cosrx products they never disappoint me, so I figured out their Cosrx BHA Blackhead Power liquid could work well on my sensitive skin and the reviews in the blog-sphere were mostly positive. The Cosrx BHA Blackhead Power liquid promises to exfoliate and prevent acne and mainly blackheads. Additional, brightener and whitening the skin for a more even tone, creating smooth skin. You can see how carefully short the ingredient list is, there are minimal fillers added, free of fragrance and alcohol. The active* ingredient in this product is BHA product, BHA (Beta Hydroxy acids) is a chemical exfoliate that is able to penetrate pores (oil soluble) and unglog them, basically removing built up oil debris and dead skin cells. Further, there are also other known benefits of using BHA, its anti-inflammatory, anti-bacterial, helps fade PIH and smooths out the skin surface. You probably know BHA under the name salicylic acid, which is a very effective and the most common form of BHA. However, Cosrx BHA Blackhead Power Liquid contains 4% betaine salicylate, a more gentle form of BHA, often used by used by Korean company's. Korea has strict regulations for Salicid acid used in cosmetics so most company's use betaine salicylate instead. The last one seems to be a nice alternative for me especially if you consider my skins reaction to salicylic acid. 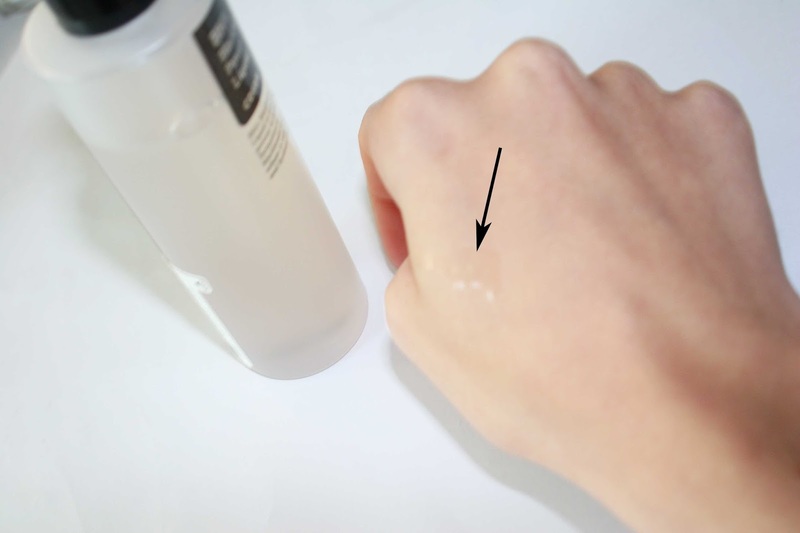 Betaine salicylate is more suitable for sensitive skin, perfect try for me. In addition this product contains one of my favorite ingredients, Niacinamide, a scientifically proven whitening and brithening agent. 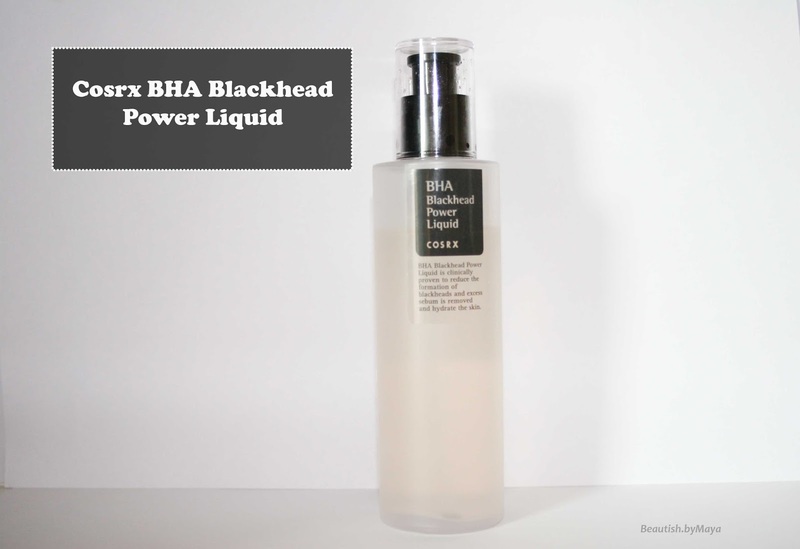 The BHA Blackhead Power Liquid comes in a simple but convenient 100 ml plastic pump bottle with. The bottle is transparent so you can see how much to use and how much is left. The pump is easy to use, you can easy control the amount needed. You have to apply it before your regular skincare routine, so before essences, serums and creams. If you use actives* always apply the one with the lowest pH first and proceed with products that have a higher pH. I use the vitamin C C21.5 (pH of 3-3.5) let it do its work for 10-15 minutes and then apply Cosrx BHA Blackhead Power Liquid (pH about 4), then wait for 10-15 minutes and proceed with my skincare routine. There is debate on whatever it is necessary to wait between steps especially after cleansing, my personal opinion is 'yes' if your are using actives you don't want anything on top to interfere with its function, by increasing yours skins pH and thus making the environment less acid for the actives* acids to do its work. The consistency is transparent liquid, it has a sweet scent but not strong. I don't feel any tingling sensation. I use just one pump to apply over my entire face. When I first started using it I made the mistake of introducing it to fast into my skincare routine. I started applying it once a day every morning after vitamin C serum. Initially, I liked the way my skin looked after using it; smooth, blackheads began to vanish dry out. However, after a while I noticed small bumps popping up on my forehead, an area I usually don't get any blemishes. Firstly, I thought the product just didn't work for me and I had to stop using it. Then I realized that it might be over exfoliating, as I mentioned earlier my skin is very sensitive and reacted in the past to chemical exfoliation products, however it was different now no flaky skin, no redness only some small pimples and bumps. Still, I stopped using it and waited for about 4 weeks before introducing it again, giving it a second chance. This time introduced it into my night time and surprising saw my skin glowing and smooth the next morning, the results very amazing form one time using. I introduced it slowly and now I'm using it a 4-5 a week, once a day for about one and half months, without any issues, clear forehead this time. My blackheads look smaller now, some are dying out, pores are tighter but in general the results are not very obvious, perhaps I need to use it for a longer period of time. What I love the most about it now is that it makes my skin smooth and evens out the skin tone! I will keep using the Cosrx BHA Blackhead power liquid, hoping to see a significant reduction in blackhead, acne scarring and whitening effect. For now blackheads seem to dry off, so I expect to see less of them in the future. Lesson learned, always introduce chemical exfoliates slowly into your skincare regime. My skin seems to tolerate betaine salicylate well compared to salicylic acid (I used the Murad BHA and AHA products before). I have never tried the famous Paula's Choice BHA toners so cant say how they compare. Honestly, I have a problem with the brand, don't like their marketing strategy which is based on bashing out other brands, so no trust in such a company. You can purchase the Cosrx BHA Blackhead power Liquid on Wishtrend* here for 14.80$, its also available in webshops such as roseroseshop, Aamzon* and testerkorea. *This post contains affiliate links (market with an *), shopping with them will support the blog. Thanks :) no I didn't change anything particular yet, actually I want to personalize the cover picture but have to make time for it! 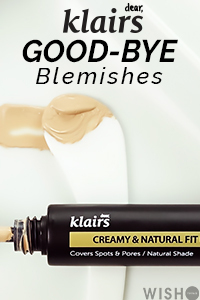 I purchased this a while back but only used it once because I wasn't sure how to apply it properly and then I forgot about it :x thanks for the review, I will definitely look into using it again, it sounds like a great product to add to my skincare! Thanks ) following you too in GFC. Sounds an amazing product. Adding this to my wish list. We have the same skin type! I need to get my hands on this product ASAP! Thanks for sharing! Interesting post! I am thinking if I should start introducing some chemical exfoliation into my routine. Still can't decide between AHA, BHA and the C.21 Vitamin C serum (I know I could combine some but want to take it slowly). How should I start? I'm confused because Wishtrend says not to use the C C21.5 serum with products that have a high percentage of AHA, BHA, etc. What is their definition of "high" though?